With just 10 days left until the new Netflix movie Bright debuts, a final trailer has been released with new footage. This climactic final trailer for Bright features a hot new single from Billboard's "Breakthrough Artist" Camila Cabello and musical duo, Grey called "Crown." This new song will also be included on Bright: The Album available on December 15th. Bright: The Album is produced by Atlantic Records and David Ayer, who were also behind the sensational soundtrack, Suicide Squad: The Album. This trailer begins with a scene showcased in a Bright clip from last week, which shows how Will Smith is not a fan of orc music. Will Smith and Joel Edgerton take on a world of evil in the streets of Los Angeles for their highly-anticipated Netflix Film, Bright, directed by the Suicide Squad and Training Day's David Ayer. Bright captures the story of two LAPD police officers played by Smith (Officer Ward) and Edgerton (Officer Jakoby) fighting off orcs, fairies and one atomic blonde elf played by Noomi Rapace (Leila) to save the fantastical world as they know it. The unlikely pair must put aside their differences to protect Los Angeles from the lurking sinister forces of the underworld. The trailer also gives us another look at one of the other pivotal characters, Tikka, played by Lucy Fry, who, as Jakoby reveals, has come across a "nuclear weapon that grants wishes." It doesn't take long for Will Smith's Ward and Joel Edgerton's Jakoby to realize that, if this weapon gets into the wrong hands, like Noomi Rapace's nefarious character Leila, it could destroy the world as we know it. This trailer also illustrates how new Jakoby is to the police force, with a new scene where both Ward and Jakoby get shot at, with Ward asking if it's the first time he's been shot at, with Jakoby answering, "Yeah, I dislike it very much." The trailer also offers a new look at Jay Hernandez as another LAPD officer, revealing that he thought Ward was dead, to which he replies that he can't be dead because he has, "too many bills to pay. The trailer also features along a very brief glimpse at another cop pairing, played by Edgar Ramirez and Happy Anderson, although it isn't clear how they fit into the story quite yet. 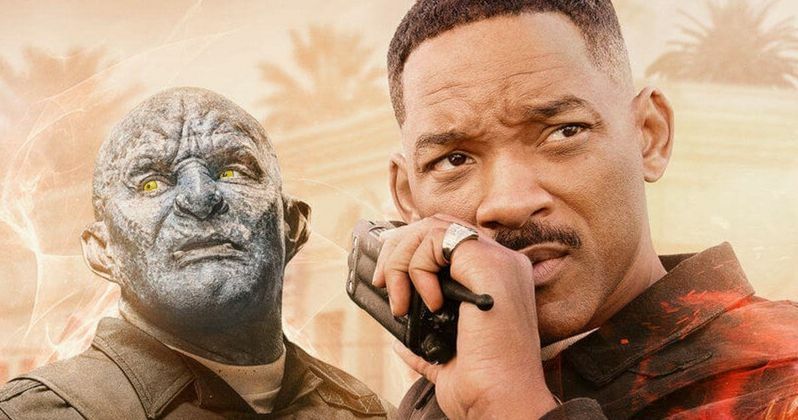 This movie marks a reunion for Will Smith, Jay Hernandez and director David Ayer, who all previously worked on last year's Suicide Squad for Warner Bros. The Netflix film stars Will Smith, Joel Edgerton, Noomi Rapace, Lucy Fry, Edgar Ramirez, Ike Barinholtz, Enrique Murciano, Jay Hernandez, Andrea Navedo, Veronica Ngo, Alex Meraz, Margaret Cho, Brad William Henke, Dawn Oliveri, and Kenneth Choi. The film is directed by David Ayer and written by Max Landis. David Ayer, Eric Newman, and Bryan Unkeless serve as producers. This movie made headlines last March when Netflix plunked down a whopping $90 million commitment for the production, including $3 million alone for Max Landis' script, in an intense bidding war. Take a look at the new trailer below, courtesy of Netflix YouTube.